Just around the corner is a casual workspace comprising a comfortable banquette, chairs and tables where TNS clients can work. The Energy Hub was conceived as TNS’ central space for the generation of ideas. It is also the place to enjoy some downtime with the on-site X-Box. The retro-Malaysian theme continues here with old-fashioned plastic string chairs and thin timber blinds, wittily emblazoned with ‘Makan & Main’ — ways in which to use the space. A chalkboard wall provides a constantly changing vista for this vibrant zone. A small nook that extends from the Energy Hub is calm respite for anyone not quite ready to get back to work. The all-white walls are enlivened with motivational posters, framed photographs as well as certificates of achievement. This is one of a few clusters of seating you’ll find spread throughout the office to encourage informal discussions. Elements typical to corporate offices like collapsible room separators meld with contemporary ideas to serve the needs of a youthful and modern corporate culture. 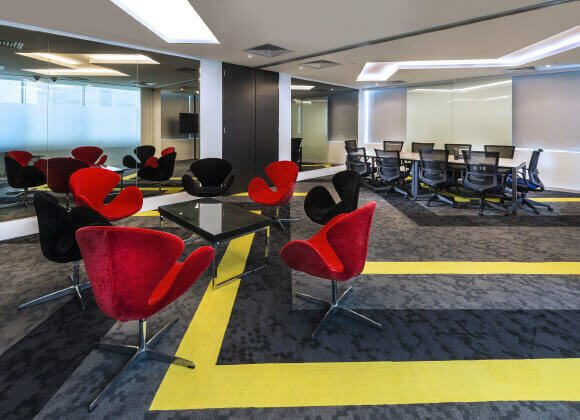 For example, meeting rooms are equipped with boldly coloured, low-slung chairs for a more relaxed atmosphere. Overall, the energy is vibrant and inspiring, conducive to a more collaborative working environment. The company practises hot desking whereby seating changes according to the nature of the project. Cabinets are used to demarcate workstations topped with lush ferns that infuse a touch of the outdoors. A cheery mural in the foyer of market research agency TNS Malaysia’s 8,500 sq ft office is a most arresting design feature. It is a scene from a traditional kopitiam from the perspective of a diner looking out to the busy road. In animated colours, the mural is completed by an actual wooden table that extends from the wall, set with porcelain bowls and shiny chopsticks that are ready to be used. 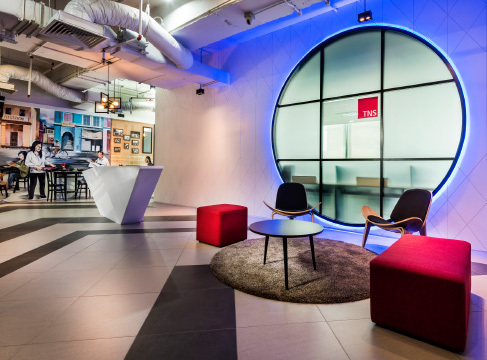 Compelling and evocative, it sets the tone for the rest of this comfortable and comforting office — retro-inspired, locally flavoured and yet thoroughly modern and contemporary. 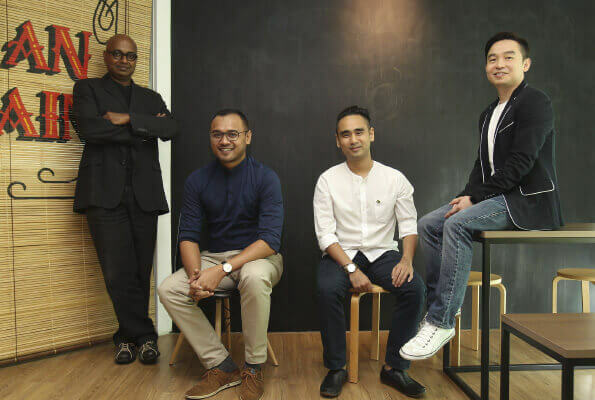 The brief from TNS Malaysia managing director M C Lai to the team from design studio iPartnership was simple, based on the needs of a youthful and modern workforce in a very customer-centric business environment. 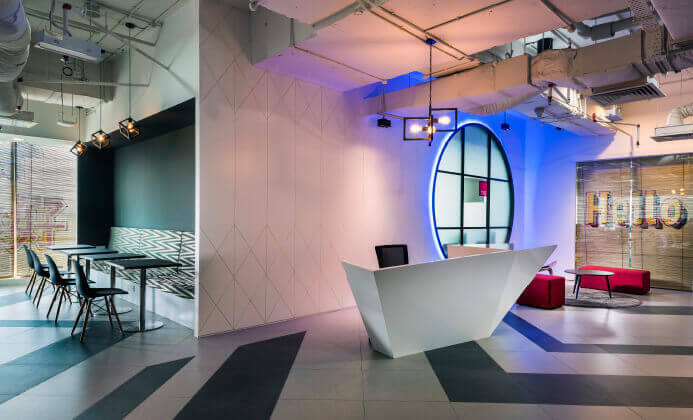 Aside from the mural, the foyer has a receptionist’s desk, a small seating area, two meeting rooms and, tucked away in a corner, a funky banquette with tables and chairs where TNS’ clients can work with some privacy. “Our clients often work here — it is a convenient location, plus they all really like the space,” Lai smiles. Beyond a solid white door lies TNS’ expansive work space. It is cheery and flooded with natural sunlight, as people work on tables arranged in a casually haphazard manner. 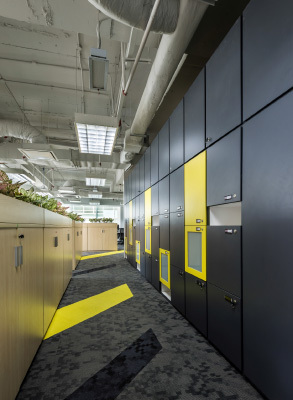 The walls are relatively bare, the colour mostly coming from the grey carpet underfoot, zig-zagged with bright swathes of yellow, and matching lockers against one wall. I suddenly notice that the worktables have no shelves or drawer units — everyone has nothing on their desks, save for the laptop they are working on. 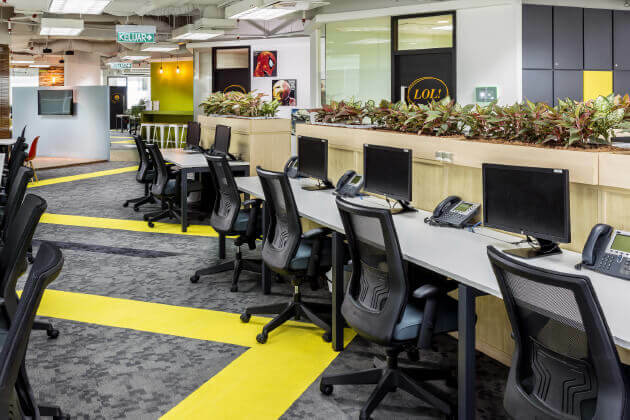 “We practice hot desking, which means no one is permanently based at one place — it makes it easier for various groups to assemble and disassemble when required,” Lai explains. “The lockers provide storage space, and also give everyone a sense of physical belonging.” Although we are in the digital age, we are not yet completely paperless, so, tall cabinets double as storage spaces and space separators, each one topped by extraordinarily healthy ferns. The quiet room — which is more of an open space rather than a formally segregated area — is for anyone who needs undisturbed time to work and therefore has no phones. Although the other desks do have phones, small padded booths equipped with a colourful chair, phone and a small desk space are custom-created for teleconferencing purposes. Another unique space is the energy hub, which is an area conducive for brainstorming and casual meetings. A television in one corner is where staff often spend their downtime with the X-Box and a karaoke machine, while mixed seating can be assembled and collapsed at will. The locally-flavoured, retro-inspired aesthetic really comes to life here with specific elements that are visually arresting — plastic wire chairs, boldly printed wallpaper and thin timber blinds, but emblazoned with texts more suited to an office rather than an old shop selling biscuits.